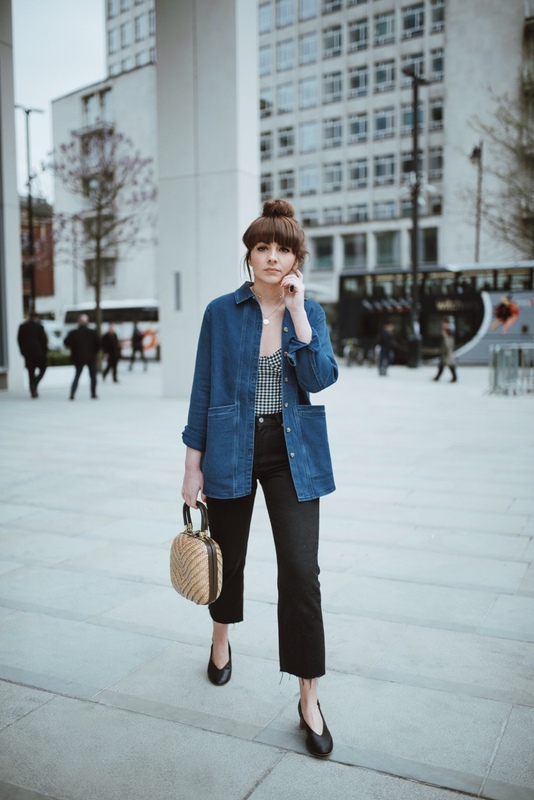 This brings me nicely to my first little style trick – always try and be one step ahead when the seasons are changing, or just in general, if you live somewhere unpredictable like Manchester. Layers are my fail-safe at this time of year, particularly light layers that I can alter accordingly throughout the day. 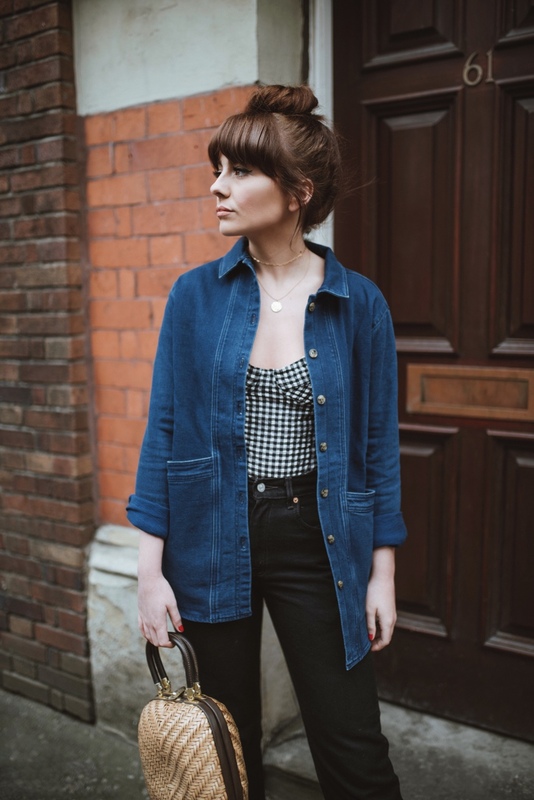 This little gingham body (it’s actually a vintage swimsuit) is the perfect piece for layering. Teamed with high waist jeans, it doesn’t make me look too summery or naked, but means if it gets warm then I can remove the denim jacket and still be weather appropriate. I could even just throw a little jumper on over the top of it if I didn’t fancy the denim combo. 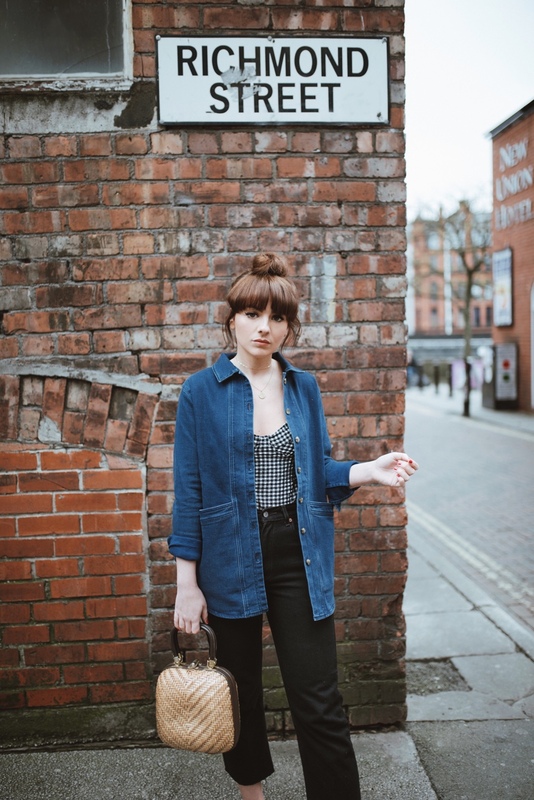 That being said, I’m really liking double denim at the moment, especially frayed black crop flares against this masculine style jacket. I have a feeling I’ll be getting lots of wear out of this combination over the coming months – it’s so comfortable but looks really put together. 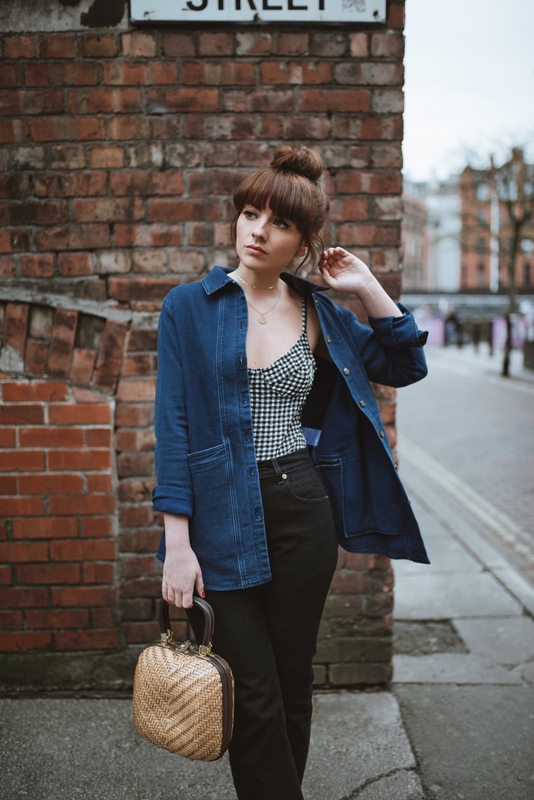 I also love how playful gingham is – it goes hand in hand with the warmer weather, and I have quite a few vintage gingham pieces that I’ve acquired over the years. However, I’m still on the hunt for the perfect gingham dress, so I’ll let you know how that goes! I really fancy a midi length one for Summer with some sort of cut out/bow detail at the waist – I have my eye on a couple that fit this criteria but have been holding off until a Summer getaway is well and truly booked. 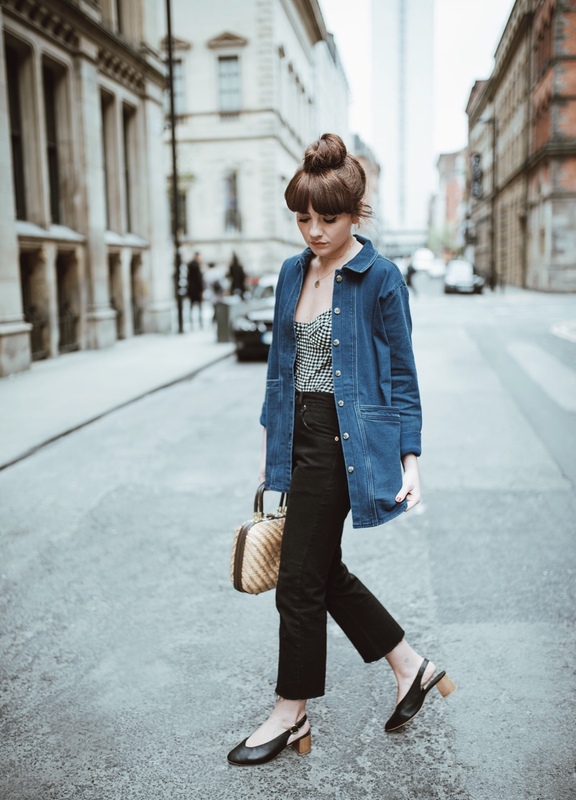 These little wooden heel sling backs were definitely one of last years best purchases – they are somehow still on the Office website, so I suggest you snap them up for Summer! I haven’t had them off my feet since it’s been warm enough to wear them – I picked them up around November time last year and they had been sitting pretty in the box, itching to get out! 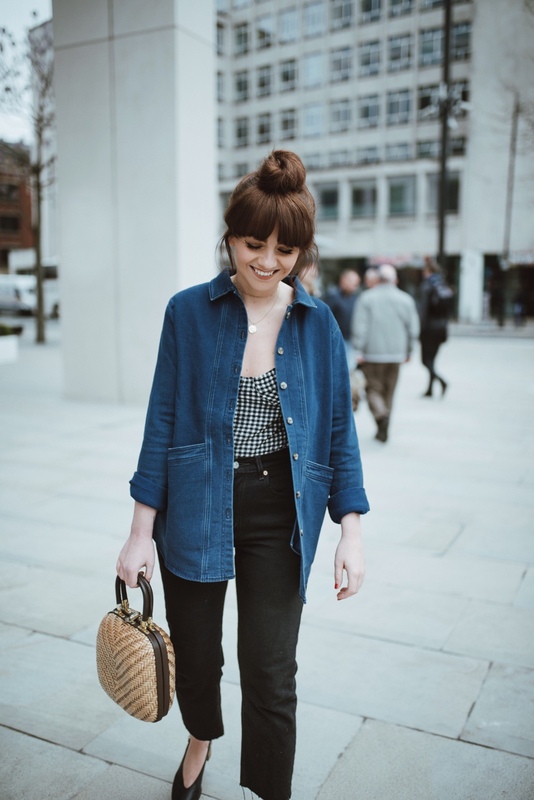 I’m a big fan of a wooden heel – I think it looks really cool with denim and any kind of basket bag. 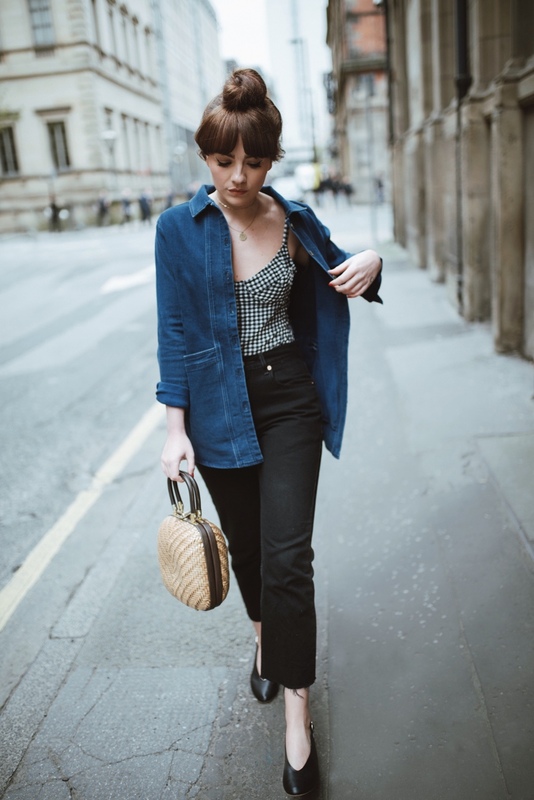 It’s these little touches that make me feel like Spring/Summer is slowly finding it’s way into my wardrobe, without quite reaching the bare legs and suncream phase. It’s probably my favourite time of year fashion wise, as it’s still cold enough to layer, but warm enough to show a little skin and wear those prettier items that have been tucked away all Winter. Such a cool look! Absolutely love it! Love the outfi! What size is the jacket you’re wearing?